It's 09:07 in East Tawas, USA right now. 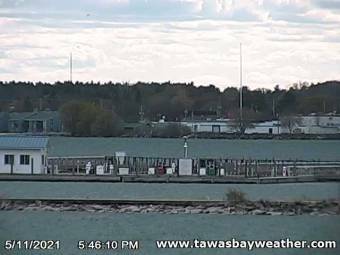 Tawas Bay, Lake Huron A webcam in East Tawas, Michigan with image archive, weather data and timelapse videos. Pigeon, Michigan: Laker Elementary School, 32.9 miles away. Alger, Michigan: River View Campground & Canoe Livery Moffatt Landing Cam, 33 miles away. Bay City, Michigan: Killarney Beach, 51.3 miles away. Gerrish, Michigan: Higgins Lake, 60.8 miles away. Kincardine: Harbour Webcam, 92.1 miles away. Grand Blanc, Michigan: Grand Blanc Perry School, 93.7 miles away. Owosso, Michigan: Owosso High School, 95 miles away. Tustin, Michigan: Several Views, 98.3 miles away.